We live in challenging times. Natural ecosystems are collapsing. World population is increasing. On average, a thousand animals are slaughtered every minute in a small country like The Netherlands, day after day, year after year. Imagine the numbers world wide! Time for change? More and more people are saying HELL YEAH! And this is good news, because it means that people are increasingly willing to take a good look at their own ecological footprint, especially at what’s on their plate. Veganism is on the rise. Health, climate change and animal welfare are issues that drive more and more people to adapt a plant-based lifestyle. Originally seen as a fringe movement, the rise of veganism has shown us that this is not a trend but the future of consumer growth. The expansion of veganism, a movement driven mostly by the young, means that we need to re-define traditional stereotypes. The idea that real men eat meat no longer rings true in this day and age. Having always done something a certain way, has never been a good excuse to keep on doing it. We need a reset. But how? So Maartje Borst and Lisette Kreischer felt it was time for Man.Eat.Plant.! MEP is not only a book, not only a blog, it is a signal to the world that shows us that it is no longer macho and no longer necessary to eat animal products. Smokey? Right on. Bloody? Beets can bleed. Blackened? Count on it. 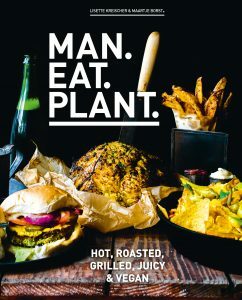 Man.Eat.Plant. will show the world that everything we think we know about food can be turned upside down without having to give up anything. You only gain…everyone gains. So BREAK yourself free from the idea that meat and dairy are necessary! Spoil yourself and your fellow residents on this earth with a step forward in evolution and use the incredible knowledge and expertise that we, as human beings, are gifted to cook THE HELL out of plants. Start a riot on your grill or BBQ and scorch those vegetables! Throw in a sauce grenade and umami bomb! PREPARE FOR BATTLE and experience a range of gruesome pleasurable sensations! The Man.Eat.Plant. 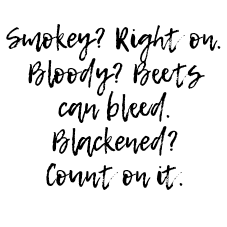 cookbook is a super cool cookbook full of powerful and savory flavors and firm textures, and thus feeds a killer movement for which no one needs to be killed, because it is rooted in compassion and based on the power of plants. The recipes are simple and effective and the interviews powerful and inspiring. Derek Sarno, Loui Blake, Tobias Leenaert, John Lewis aka Badass Vegan, James Aspey, Menno de Koning, Tom Zwarts, Bas Waijers, Johnas van Lammeren, Maarten Burgers and Jay Brave all shared their insights and knowledge how to be a true warrior fueled by plants. 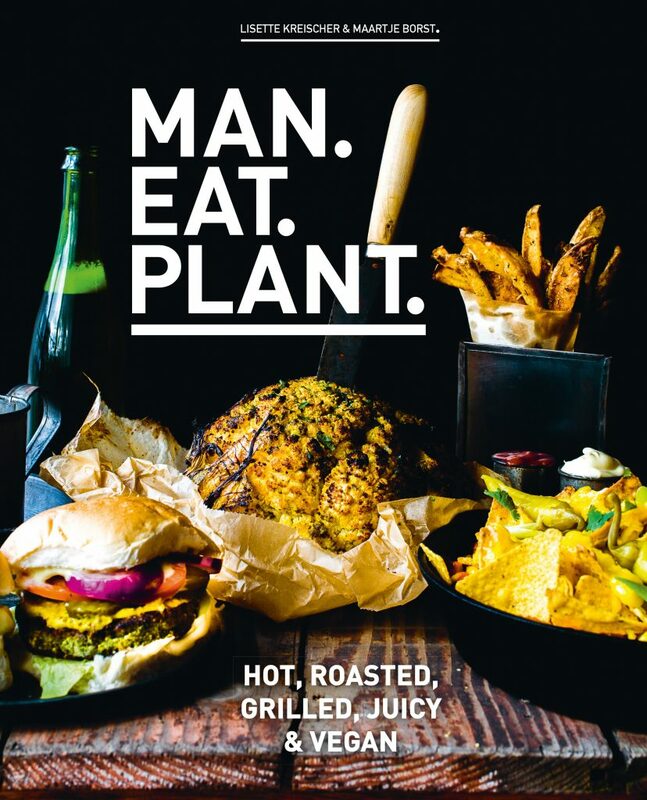 Man.Eat.Plant has been published in Dutch and we are desperately searching for an international publisher willing to translate Man.Eat.Plant. into English. So if you are that publisher or you know someone that can help us, LET US KNOW! You can browse through some pages of the book here! You can buy the book (in Dutch) here!